The HTC One E8 is the phone I never thought I'd see. Given HTC's big push into making design the most important element of its flagship One M8 phone, why lose it? And this theme returns when you turn the phone over: all the talk of the importance of the duo camera, with Ufocus and other assorted Ultrapixel gubbins, is gone in favour of an off-the-shelf 13MP sensor. What gives, HTC? It's nearly 30% cheaper? Oh. That makes sense. Beyond that, we're treated to the HTC One M8 spec for spec. That means a Snapdragon 801 chip inside, the same larger 2600mAh battery, a glorious Full HD 5-inch Super LCD3 screen, a microSD slot and, well, you might as well just read the spec sheet for the One M8 to get the full picture. Oh - the IR blaster on the top is gone. That's important if you like the thought of controlling your TV with a phone. The key question here is whether or not you'll be able to buy it. It's not a lot of good thinking about this as your next prospective phone when it might not be available in your country. Annoyingly HTC is being a little cagey about this fact – so I'm not sure if it will be coming to the UK, US or Australia any time soon, and even the third party retailers, usually the treasure trove of underground handsets, have nothing to report. So that presents a problem – but there are always ways to get your hands on one. So that begets the next question: by taking away the metal design, the reason for the HTC One M8 to enamour so many, has the company taken away the soul of an award winning phone and created a zombie version to just shift more units? 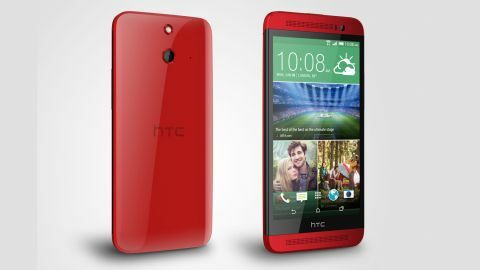 Will the plastic design cause users to remain disinterested in the HTC brand, causing fewer to buy in the future? So, let's get down to it: how does the new polycarbonate cladding feel in the hand? I was sent the Electric Crimson version of the phone to test out (come on, if that's an option on the list to choose, it was impossible to go for anything else) and it's a shiny plastic, rather than the matte grey finish. This means it's as slippy, if not even less grippable, than the metal of the One M8, although if you plump for the matte version (rather than the gloss on test here) you'll be able to hold onto it a little better. The plastic back feels solid, makes the phone lighter and, as I said, dispenses with the IR blaster on the top, which has the effect of moving the power button to the centre. It's a slightly odd place to put it, but it's easy to hit and still raised. It's intriguingly the same design as seen on the original HTC One... well, intriguing if you've got nothing else to think about. The volume key on the right-hand side is also plastic, as you'd expect, and probably feels like the cheapest part of the phone. I'm not a fan of the lighter chassis, as I loved the great balance of the One M8, but the One E8 will probably appeal to those looking to spend less without losing the unibody package experience. I oddly didn't mind the plastic casing of the E8, despite going into the review thinking that would be the biggest problem. Some commenters have claimed that all phone reviewers only ever like metal phones, which simply isn't true. I like well-designed phones and you do too. For instance, the Nokia Lumia 930 is mostly plastic, but retains a metal rim to add a touch of class. The LG G2 was all plastic, but the unibody design felt solid and impressive. Even Samsung's Galaxy S5 is the most sturdy of the interstellar range, but the faux-chrome outer and removable back mean you can feel the hollow nature of the phone. It can be placed in trees. Technology, tested... that's us. It's the same as the LG G3 – a phone that looks metal and has all the removable battery and microSD slots people crave. But hold it and you can tell the back comes off, as there's a slight flex and lightness that ruins the ergonomics. So is the HTC One E8 terribly designed as a result of being plastic? No – like the iPhone 5C, it retains a sense a fun and the colours really add to the mix. It's a good enough trade off if you want the HTC UI but can't afford the M8… although with the Duo Camera gone too, you'll have to REALLY want the Sense UI and Boomsound speakers… and I don't think enough people will be after that. Is the lack of an infra-red port, the thing that lets you control your TV with your phone, a big loss to the phone? Well, apart from making the aesthetic of the One E8 a little less sumptuous, it's barely missed. I keep pointing out that holding your phone like a remote control is impossible as you're missing the tactility of the buttons, but apart from LG with the G Flex (which had the sensor on the back, meaning you could hold the phone up to see what you're pressing) nobody has done anything about it. The disappearance might irk some, but in reality it wouldn't be missed on the One M8. As mentioned above, the main reason for losing many of the good bits of the One M8 on the E8 is the price drop, and it's pretty big considering. If it ever launches in developed smartphones markets, it should be around 30% cheaper than the One M8 (according to Russian price disparity, which is one of the few places you can currently pick this phone up). It can also be handled with one hand. Testing is easy. So if you get your hands on the One E8 (and that's a big if, as HTC has yet to confirm availability in the more premium smartphone markets, focusing the E8 in other more developing parts of the world) you'll be paying a lot less. It's hard to say whether this is the right move - it depends if the One M8 and E8 will be sold side by side. If they are, then it's a cannibalisation exercise. People won't want to pay that much more for a metal back and two cameras, and it could harm the sales of the One M8 as a result. Also, where does the One Mini 2 fit into the equation? Or the Desire 816? For a company that was planning to make fewer phones, HTC is certainly churning out the handsets. Here's something that will confuse a lot of people if the two phones are placed side by side in a shop: the camera on the HTC One E8 is going to be a 13MP affair, with single flash LED rather than the all-singing One M8, with its Duo Camera and Ultrapixels and Ufocus background defocus. The 13MP snapper here has all the power and toys the One M8 has (bar the defocus post processing) so you can take Zoes, HDR shots, videos and more without a problem. More holes. We need more holes. The front facing camera isn't the same as found on the One M8, as it's not got the wide angle effect – so it's the same one as seen on the One Mini 2 and the Desire 816 – but that doesn't mean this isn't a strong phone if you like to take loads of self portraits. But the back camera looks great still, and the sharpness from the off the shelf sensor seems to be very good indeed. In terms of bringing the toys from the One M8 to the E8, the one I'm most glad to see it Motion Launch - mostly from a muscle memory point of view. This option allows you to double tap the screen to wake the phone (as long as you've moved it and activated the accelerometer, meaning you won't be able to use it when the phone is placed on a desk) and gain instant access to the time and the quick widgets in the lock screen. (Side note: even picking it up and moving it around, the double tap screen unlock fails to work on occasion. It's like the One E8 can't always get its accelerometer to work). But that might be a little bit too simple for some people - what if you want to wake the phone properly, or go into the Blinkfeed view? Perhaps you want to start the camera from cold? The good news is all this is possible: swipe from the left or right, even with the screen off, and the One E8 is always ready to open up the home screen or Blinkfeed respectively. It's a neat trick and one that I find myself using more and more. You can always tell when something is a good idea when I do the same thing on other phones - and that's the case here. Sadly, there's something I'll never use: holding the volume down key and turning the phone on its side to wake the camera. It just doesn't work regularly, which leads to frustration and feeling like the phone doesn't work as well as it should. You can just turn on the screen with a double tap and flick the camera icon to do the same thing - and this works much, much more quickly. HTC has put a couple of other 'swipe commands' into the mix, with swiping down from the top activating voice dialler (good for in car) and from the bottom for Google Now. I'd much rather be able to customise these to my own commands, but that's not possible for now. Given the cut-down-but-powerful nature of the One E8, I'd have not been surprised to see the BoomSound speakers, which flank the screen at the top and bottom, be cast aside too, given they need extra circuitry and chips to work. But they're here, and they're still as bass-rich and powerful as before. I can't be sure, as it's hard to really tell the difference when the components aren't the same, but the plastic housing doesn't seem to give quite as clear a sound as the metal one does, which would make sense from a physics point of view. Don't let that put you off though - the speakers are still one of the most stunning things about HTC phones, and frequently something I'll turn on to impress others. Even playing a driving game is a much more delightful experience with BoomSound, as it means that the engine notes, the rich throttle sounds and brake squeals are brought to life in a way that you don't get if you're getting all the sound pumped out of the back of a tiny speaker. Do you need BoomSound in day to day life? Not at all. It's certainly a luxury, but one that when you do use it, you'll be glad it's there.